Anti-dust/water handle lock Model： Vending machine lock with anti -water cover.key out at 12 o'clock only. Key out at 12 o'clock only. 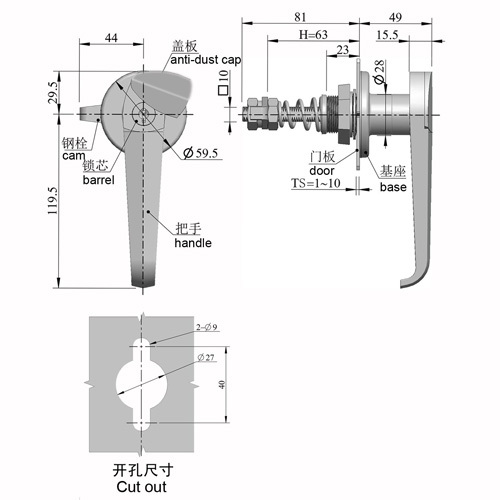 Adjustable the installation between handle and escutcheon for being suitable for right or left door. Mingyi Light is professional as one of the leading manufacturers and suppliers of 60020 anti-dust/water handle lock ,vending machine lock cabinet l handle lock available for 100 combinations key out at 12 o' clock only.suitable for right or left door in China. And our factory is located in the convenient city, Quanzhou, enjoying convenient transportation. Please rest assured to buy general products with us or try our customized service.